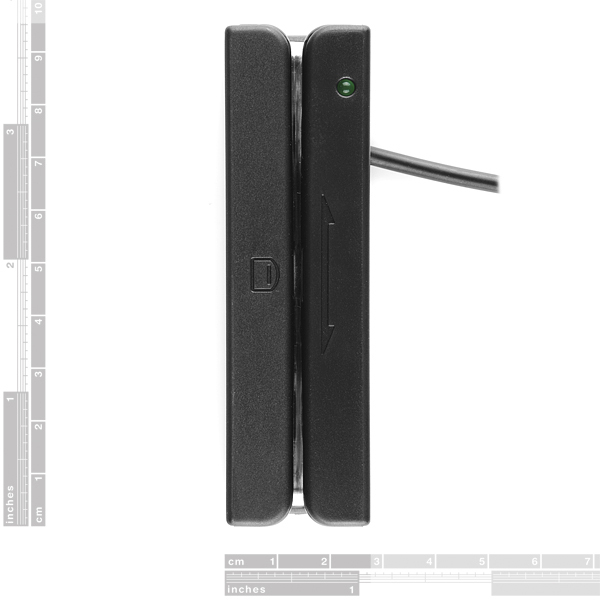 This is a simple three track magnetic card reader with serial output. 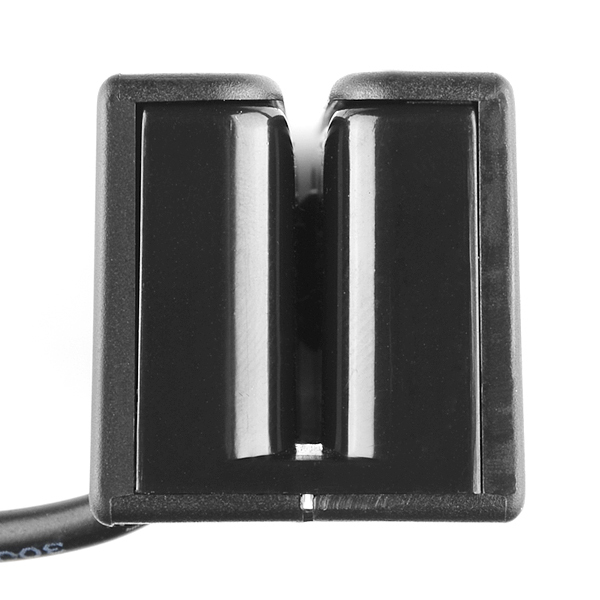 This reader connects to your computer with a DB9 for serial and a PS/2 for power and outputs a 9600bps 8N1 ASCII serial stream. Plug the reader into a serial port (or USB to serial converter), swipe your frequent shopper card, and you'll see the account number plain and unencrypted on the screen. We couldn't find a card the reader couldn't read. No drivers needed. No software needed. Just pure, wonderful serial. After buying this reader, I cut the cabes and connected +5v, GND, RX and TX to my arduino in order to read serial values into my mac. Does anyone know a good arduino sketch that reads and decodes the card data (i.e. driver's licences?). I'm still fairly inexperienced with arduino code - so I'm having a hard time decoding the incoming bytes. The ASCII that comes in is the same each time per card (...good sign), just not sure where to go from here. Help?! THANKSSSS! Sparkfun has a frequent shopper card? Great! Has anyone found a working Arduino Sketch for this reader? I thought this would be an easy task but I was very wrong. Got it connected to TX/RX PW/GND but all the sketches I've found is for a 5 wire system. I just want to read the number on track one and send it to a web server. I've got RFID working the same but cant seem to get this. DB9 and PS/2??? What century is this? I'm not sure I have a computer with either of those connectors. I might have an old desktop, but it wants a mouse or keyboard in its PS/2 connectors. DB9 and RS-232 are still pretty common for geekish pursuits; serial's quick cheap and easy. 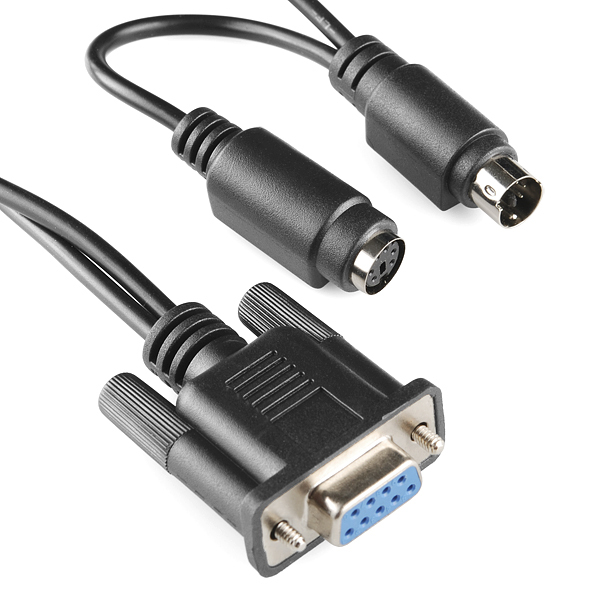 For the PS/2 port, as all it wants from said port is power and ground, you could either perform surgery to snip off the ps/2 connectors to apply power directly, or snag a din-6 female connector if you don't want to go chopping up hardware you haven't tested yet. But in general concept, I agree. There are lots of USB readers that'll handle track 3 cards for less than this, SFE should carry one of them. I just got this a Few days ago and am very pleased how will it works. Started out using it with the RS-232 to see how it worked. Then I opened it up removed the cables that came with it. I add 3 wires which were, 5 volts, ground ,and the last wire was solder to pin 10 of the SP232 chip. This gave me a 5 volt TTL out. I connected it to a Arduino Teensy 3.1 which work great. A good starting point for code is is the MultiSerialMega in the example code. The output from the reader just show up in the serial monitor with no changes to the code. For this to work your Arduino needs to have at second serial port for this to work. How can I integrate this to a Visual Studio program? I am thinking about buying this card reader for a side project. I wanted to know if I use the PS/2 adapter (https://www.sparkfun.com/products/8509) and plug those into the arduino will it work right away or do I need to download an arduino keyboard library for it to work? Thanks in advance! 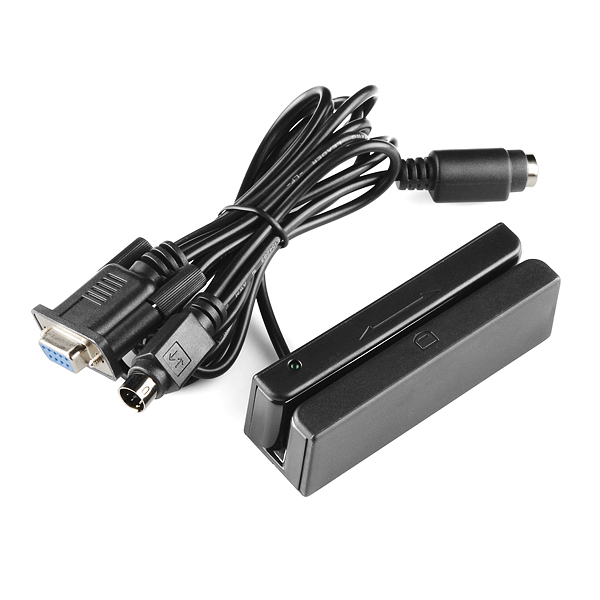 If you want to do everything by USB, or if you are using some of the newest PCs available (that have no serial or PS2 ports), you can use a USB to serial converter for the data, and a USB to PS2 converter for the power (such as this one http://www.neworldit.com/ProductDetails.asp?ProductCode=13790345101). Just make sure that your computer has at least 2 unused USB ports. If you have 1 or 0 unused USB ports, you will need a powered USB port hub. Can anyone with one of these tell me how durable they look/feel? I need one to be mounted outdoors. I would not mount them outdoors. The data sheet says it must operate below 90% relative humidity. Has anyone else ever faced any difficulty with reading Track 3 data stored in a Driver's License? We bought this card reader along with a shifter to convert RS232 to TTL and connected the card reader to arduino with the DB9 pins - black and red wires to GND & 5V, and the data wires to RX /TX. It was suggested that we use the PS2 wires for powering the device, but the DB9 wires seem to work fine. The card reader powered on in an instant and started reading swipes. The card reader reads Track 1 & Track @ data for Driver Licenses and Credit Cards. But, I am yet to see any Track 3 data. We have tried TX and CA licenses. I am assuming that they have track 3 data encrypted per the format descriptions available online. I just received my Magnetic Card Reader SEN-11096 but when I slide a card through, I don't see any info. Isn't this plug/play? Make sure you are plugging in the PS2 port, otherwise the reader won't be powered. Double check your settings in your terminal program as well. If you are still running into issues with this after checking those, please contact us at techsupport at sparkfun dot com. You still need to plug in the PS2 port to power the device. http://mbed.org/users/4180_1/notebook/pollo-magnetic-card-reader/ has a code example for mbed. I believe Sparkfun selected this product on purpose instead of the usb version. Much more hackable, much more open. In my opinion, this is not intended to be hooked to a PC but to a micro-controller or similar. If you want to read a magnetic card thru your PC you can find other products much cheaper that connect through USB. Is this a single track reader or multi-track? In either case, what tracks does it read? Most cards have 2 or 3 tracks. It's a three track reader. In the end, I only needed a 5 V, GND, and RX connection to the Arduino. It just seemed like all the extra hardware was overkill to get the connection job done. Nothing bad to say about the product, it's working flawlessly !